– Together with your brother, you have the responsibility to take care of the family’s ten buffalos, three goats and your three-year-old sister when your parents and older siblings are away in the forest lopping trees for fodder for the cattle. In Jeddra kohl in Uttarakhand, on the border to Uttar Pradesh, there are since three months back fifteen to twenty Van Gujjar children challenging these unfavourable conditions by going to school almost each and every day. Under the Right to Education act, enacted by the government in 2009, every child in India between the ages of 6-14 have a right to free education. The government is also responsible to survey areas and identify how many children there are in the area and the provide facilities according to these numbers. But the record of providing accessible schools to the Van Gujjars has been poor. In addition to the one in Jeddra kohl, only three more schools are supposed to cover the whole Van Gujjar population of Uttarakhand. The start up of another of the four schools, in Choti Karondi kohl on the border to the state of Himachal Pradesh, has been in strong alignment with SOPHIA’s rights-based approach of not running schools themselves, as other NGOs in the area have done before with weak long-term results. SOPHIA’s strategy is rather to assist and pressure state governments to run school themselves. But by putting pressure on the government to implement this act and thereby setting up schools in Van Gujjar areas is not the end solution for increasing schooling years among Van Gujjar children. They also actually have to attend school on a daily basis. To do this, they have to overcome, not only the conditions described above, but also the few incentives to get educated given to them when living as pastoralist buffalo herders. Even though the Act state that the Government is responsible for bringing children to school, the education of children also need to be supported by parents and the surrounding community. And even if there are cultural and economic incentives that hinder schooling, especially among girls, all the parents we have met have a truly positive attitude to bringing their children to school. 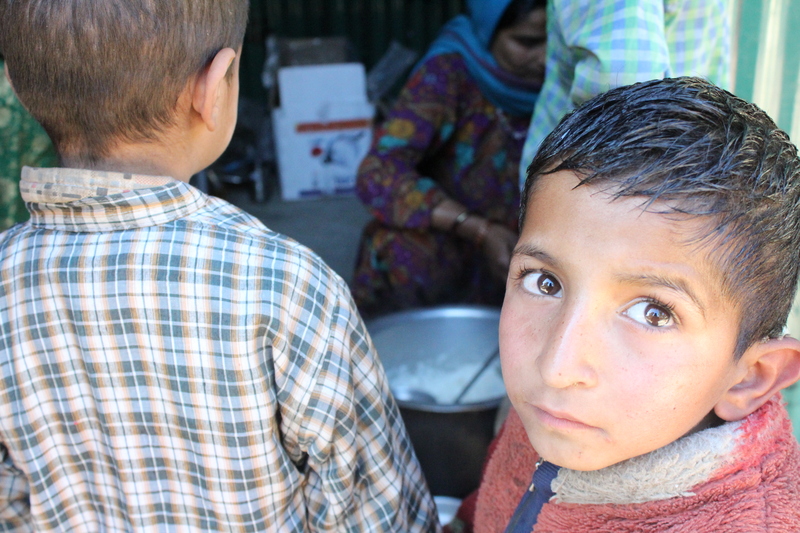 But when you live far away from villages and the only income-generating source available is the buffalo milk and working in apple orchards in summers, the economic gains of sending children to school are low. Saroj Sharma, head teacher in one of the four Van Gujjar schools in Choti Karombi kohl, tells that both the distance and the household workload are the major obstacles to bring the children to school. Almost every day Saroj travels along the kohl and visits the deras (Van Gujjar huts) in order to bring as many children to school as possible. 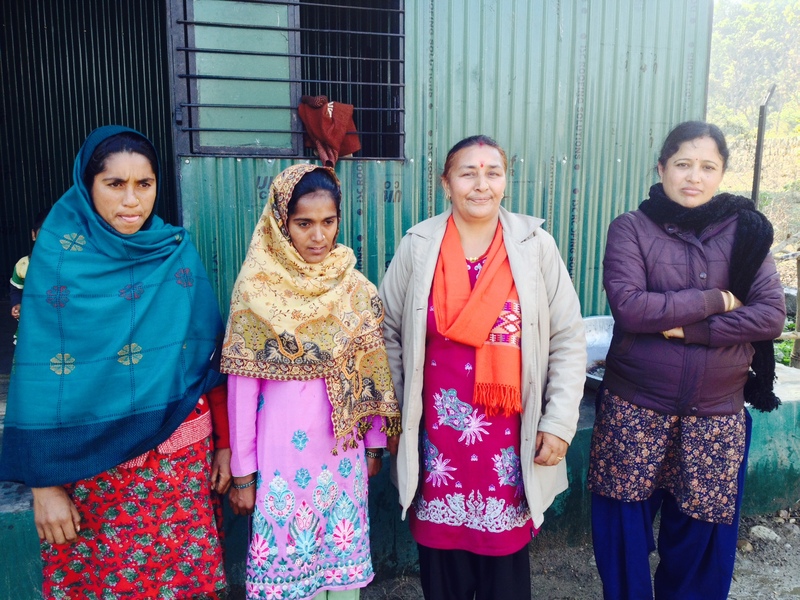 Saroj Sharma, second from the right, with the second teacher and the cooks in Choti Karombi kohl. In order to take part of welfare schemes and to be able to practice an effective citizenship, however, a basic level of literacy is needed and the Van Gujjars realise this more and more. This awareness is something that SOPHIA staff Munesh and Nazim to a high degree is contributing to in their daily field trips to the remote kohls of the Van Gujjars. Thank´s Johan for an insightful report about the Van Gujjars struggle in the mountain areas on a daily basis and specially the difficulties they face according to be able to get education. This is why SOPHIA´s long term work is so important! Tack för uppskattningen, Marjo! Ja, det är verkligen få barn av dem vi träffat som har möjlighet att få gå i skolan. Men det är möjligt. Jag är i Karnataka nu och besöker en organisation som jobbar med forest rights med tribals och här finns det skolor även djupt inne i skogen. SOPHIA får fortsätta sitt jobb med att lobba mot delstatsregeringarna helt enkelt.